By then it had been reported in the media for weeks that the assault was indeed an attempt by elements of the Syrian Army, Iran-backed militia members, and Russian paramilitary contractors to seize the Conoco natural gas field from SDF and U.S. forces, possibly with the approval of the Russian Ministry of Defense. Damascus considers the re-acquisition of those oilfields to be a “strategic intent” to finance the country’s reconstruction, and Moscow has been more than willing to help. Iran, incidentally, is determined to establish a land route to its Mediterranean allies via the Iraqi border and Deir Ezzor. 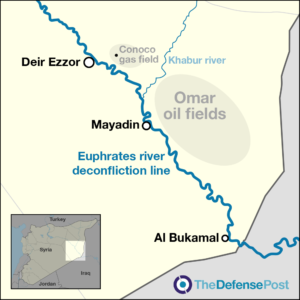 Source: Why won’t Secretary Mattis say the US controls Syrian oilfields? The artillery barrage was so intense that the US commandos dived into foxholes for protection, emerging covered in flying dirt and debris to fire back at a column of tanks advancing under the heavy shelling. It was the opening salvo in a nearly four-hour assault in February by around 500 pro-Syrian government forces – including Russian mercenaries – that threatened to inflame already simmering tensions between Washington and Moscow. In the end, 200 to 300 of the attacking fighters were killed. The others retreated under merciless air strikes from the US, returning later to retrieve their battlefield dead. None of the Americans at the small outpost in eastern Syria – about 40 by the end of the firefight – were harmed. The details of the 7 February firefight were gleaned from interviews and documents newly obtained by The New York Times. They provide the Pentagon’s first public on-the-ground accounting of one of the single bloodiest battles the US military has faced in Syria since deploying to fight the Isis. The firefight was described by the Pentagon as an act of self-defence against a unit of pro-Syrian government forces. In interviews, US military officials said they had watched – with dread – hundreds of approaching rival troops, vehicles and artillery pieces in the week leading up to the attack. The prospect of Russian military forces and US troops colliding has long been feared as the Cold War adversaries take opposing sides in Syria’s seven-year civil war. At worst, officials and experts have said, it could plunge both countries into bloody conflict. And at a minimum, squaring off in crowded battlefields has added to heightened tensions between Russia and the US as they each seek to exert influence in the Middle East. Commanders of the rival militaries had long steered clear of the other by speaking through often-used deconfliction telephone lines. 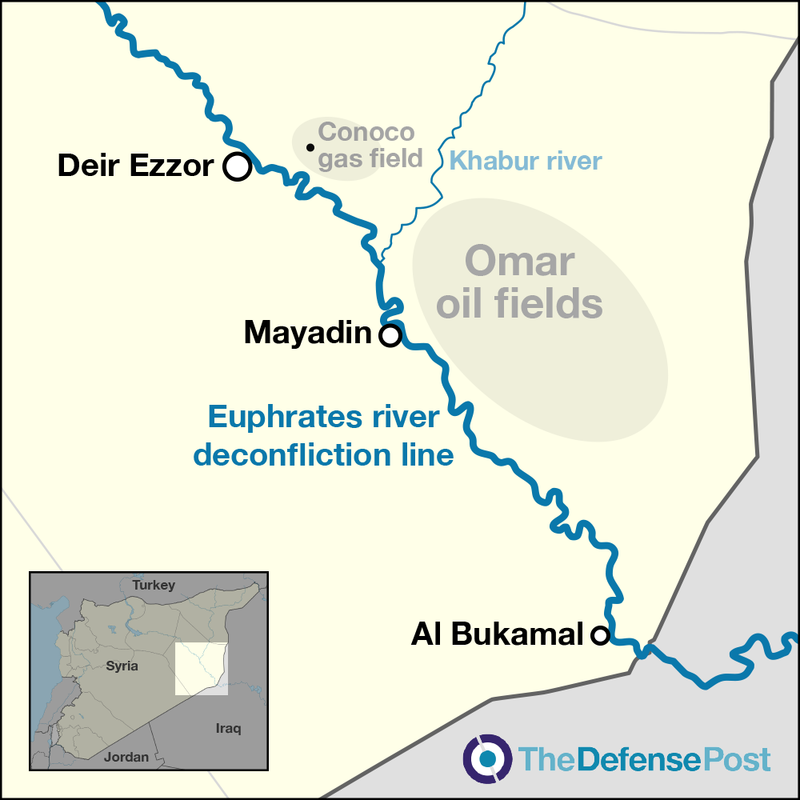 In the days leading up to the attack, and on opposite sides of the Euphrates River, Russia and the US were backing separate offensives against the Isis in Syria’s oil-rich Deir el-Zour province, which borders Iraq. US military officials repeatedly warned about the growing mass of troops. But Russian military officials said they had no control over the fighters assembling near the river – even though US surveillance equipment monitoring radio transmissions had revealed the ground force was speaking in Russian. The documents described the fighters as a “pro-regime force,” loyal to President Bashar al-Assad of Syria. It included some Syrian government soldiers and militias, but US military and intelligence officials have said a majority were private Russian paramilitary mercenaries – and most likely a part of the Wagner Group, a company often used by the Kremlin to carry out objectives that officials do not want to be connected to the Russian government. A team of about 30 Delta Force soldiers and Rangers from the Joint Special Operations Command were working alongside Kurdish and Arab forces at a small dusty outpost next to a Conoco gas plant, near the city of Deir el-Zour. At 3pm the Syrian force began edging towards the Conoco plant. By early evening, more than 500 troops and 27 vehicles – including tanks and armoured personnel carriers – had amassed. In the US air operations centre at Al Udeid Air Base in Qatar, and at the Pentagon, confounded military officers and intelligence analysts watched the scene unfold. Commanders briefed pilots and ground crews. Aircraft across the region were placed on alert, military officials said. Back at the mission support site, the Green Berets and Marines were preparing a small reaction force – roughly 16 troops in four mine-resistant vehicles – in case they were needed at the Conoco plant. They inspected their weapons and ensured the trucks were loaded with anti-tank missiles, thermal optics and food and water. At 8:30pm, three Russian-made T-72 tanks – vehicles weighing nearly 50 tons and armed with 125-millimeter guns – moved within a mile of the Conoco plant. Bracing for an attack, the Green Berets prepared to launch the reaction force. At the outpost, US soldiers watched a column of tanks and other armoured vehicles turn and drive towards them around 10pm, emerging from a neighbourhood of houses where they had tried to gather undetected. Half an hour later, the Russian mercenaries and Syrian forces struck. The Conoco outpost was hit with a mixture of tank fire, large artillery and mortar rounds, the documents show. The air was filled with dust and shrapnel. The US commandos took cover, then ran behind dirt berms to fire anti-tank missiles and machine guns at the advancing column of armoured vehicles. For the first 15 minutes, US military officials called their Russian counterparts and urged them to stop the attack. When that failed, US troops fired warning shots at a group of vehicles and a howitzer. US warplanes arrived in waves, including Reaper drones, F-22 stealth fighter jets, F-15E Strike Fighters, B-52 bombers, AC-130 gunships and AH-64 Apache helicopters. For the next three hours, US officials said, scores of strikes pummelled enemy troops, tanks and other vehicles. Marine rocket artillery was fired from the ground. The reaction team sped towards the fight. It was dark, according to the documents, and the roads were littered with felled power lines and shell craters. The 20-mile drive was made all the more difficult since the trucks did not turn on their headlights, relying solely on thermal-imaging cameras to navigate. As the Green Berets and Marines neared the Conoco plant at about 11:30pm, they were forced to stop. The barrage of artillery was too dangerous to drive through until air strikes silenced the enemy’s howitzers and tanks. At the plant, the commandos were pinned down by enemy artillery and burning through ammunition. Flashes from tank muzzles, anti-aircraft weapons and machine guns lit up the air. At 1am, with the artillery fire dwindling, the team of Marines and Green Berets pulled up to the Conoco outpost and began firing. By then, some of the US warplanes had returned to base, low on either fuel or ammunition. The US troops on the ground, now roughly 40 in all, braced their defences as the mercenaries left their vehicles and headed towards the outpost on foot. A few of the commandos, including Air Force combat controllers, worked the radios to direct the next fleet of bombers flying towards the battlefield. At least one Marine exposed himself to incoming fire as he used a missile guidance computer to find targets’ locations and pass them on to the commandos calling in the air strikes. An hour later, the enemy fighters had started to retreat and the US troops stopped firing. From their outpost, the commandos watched the mercenaries and Syrian fighters return to collect their dead. The small team of US troops was not harmed. One allied Syrian fighter was wounded. The number of casualties from the 7 February fight is in dispute. Initially, Russian officials said only four Russian citizens – but perhaps dozens more – were killed; a Syrian officer said around 100 Syrian soldiers had died. The documents obtained by the Times estimated 200 to 300 of the “pro-regime force” were killed. The outcome of the battle, and much of its mechanics, suggest that the Russian mercenaries and their Syrian allies were in the wrong part of the world to try a simple, massed assault on a US military position. Since the 2003 invasion of Iraq, the US Central Command has refined the amount of equipment, logistics, coordination and tactics required to mix weapons fired from both the air and ground. US intelligence officials say that the Wagner Group, known by the nickname of the retired Russian officer who leads it, is in Syria to seize oil and gas fields and protect them on behalf of the Assad government. The mercenaries earn of a share of the production proceeds from the oil fields they reclaim, officials said. The mercenaries loosely coordinate with the Russian military in Syria, although Wagner’s leaders have reportedly received awards in the Kremlin, and its mercenaries are trained at the Russian Defence Ministry’s bases. Russian government forces in Syria maintain they were not involved in the battle. But in recent weeks, according to US military officials, they have jammed the communications of smaller US drones and gunships such as the type used in the attack.